Restaurant chain Wagamama has apologised after a manager warned workers they face disciplinary action for calling in sick over Christmas. A note on a rota at one of its London branches said it was the responsibility of ill staff to find colleagues to cover shifts. Wagamama said the manager "feared team member shortages" and "regrettably decided to take this highly unusual approach", which is not company policy. 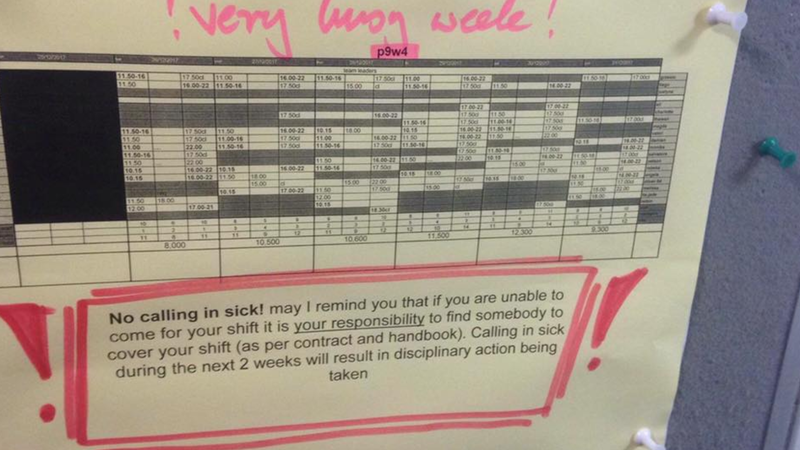 A union posted the rota on Facebook. A note beneath the rota states: "No calling in sick! may I remind you that if you are unable to come in for your shift it is your responsibility [underlined] to find someone to cover your shift (as per contract and handbook). "Calling in sick during the next 2 weeks will result in disciplinary action being taken". Wagamama insisted the rule was "strictly not company policy", and said it was an "isolated incident" at its North Finchley restaurant. A spokesman for the Unite Hospitality union said: "To threaten workers with disciplinary action for being sick is not just morally reprehensible, it may be unlawful under the Health and Safety Act and Equality Act as it discriminates against those with long-term physical or mental health conditions." The pan-Asian chain, which has been owned by the London-based private equity firm Duke Street Capital since 2011, has more than 100 branches across the UK. A Wagamama spokesperson said: "Following reports of a notice posted in our North Finchley restaurant we can confirm this was an isolated incident and is strictly not company employment policy. "As a company we treat all our team with the greatest respect and understand and appreciate the hard work they all do. We sincerely apologise for what has happened and wish all our team members and customers a very Merry Christmas and a Happy New Year." The person who brought the rota to Unite Hospitality's attention is a friend of someone who works at Wagamama in North Finchley. "They sent me that picture," he told the BBC. "They didn't want me to share it at all. But my blood was boiling. I needed to do something about it. "I don't believe it is company policy. It might have been an idea of the manager because he doesn't know the law." He said the note attached to the rota could be "dangerous for the health and safety of people". "If you force people to work when they are sick they can poison the food. There is something very wrong." He said many of the staff at that branch were young workers from Eastern Europe and "maybe they are scared to lose their jobs or they don't know the law themselves". The Green MSP for the West Scotland region, Ross Greer, was one of the first people to post a photograph of the rota on Twitter, writing: "That's the end of my custom with @wagamama_uk. Treat your staff with some respect." @dtaylor5633 also expresses concern about the potential health risks. The rota note has led a #boycottwagamama campaign on Twitter, with people voicing concern the policy may lead to sick workers undertaking shifts. However, other people say customers should not "vilify a whole company" because of an issue related to a single branch. Former employees in other branches have also taken to social media to say they have not experienced similar practices.